If you thought last weeks post about GMO’s was scary, this week’s subject should raise the hair on the back of your neck. Rev. 13:16-18 says, “He causes all, both small and great, rich and poor, free and slave, to receive a mark on their right hand or on their foreheads, and that no one may buy or sell except one who has the mark or the name of the beast, or the number of his name. Here is wisdom. Let him who has understanding calculate the number of the beast, for it is the number of a man: His number is 666.” For years we have talked and debated about the coming Mark of the Beast. There has been much speculation as to what the mark would be. Before the technological age many thought it would be some type tattoo, not unlike what Hitler did to detainees in his Nazi concentration camps. Those that remain today still bear the tattooed numbers on their arms. 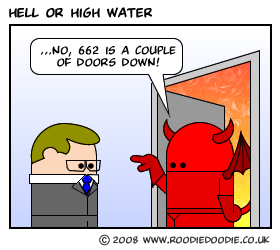 Today, more than in any time in history, the significance of the number 666 should be of keen interest to every thinking person. There are aspects of the prophecy that are becoming increasingly clear. The technology already exists and is in place to restrict buying and selling. It all began with the innocuous introduction of the retail barcode. What started as a way to speed up the grocery store checkout process has a far more nefarious possible outcome. Because the scripture challenges those of “understanding to calculate the number of the beast”, many have tried. In 2000 years nobody has figured it out, so I am not gong to be so presumptuous to think that I can. 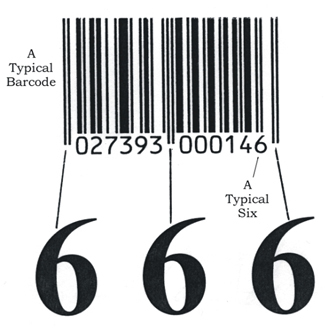 Having said that, I do find it interesting that the typical retail barcode has the number 666 embedded in every single one. There are very few occasions where you need to use cash any more to make a purchase. The debit card has made it easier than ever. We use them everyday and never think about how we are participating in a cashless society where we give vendors direct electronic access to our bank accounts. Many people never carry cash at all. Most retailers already rely on the scanning devices to read the prices on the barcodes. The same device could be used to scan people instead. Why go to all the trouble of carrying around a bulky debit card when the same information could easily be implanted under the skin and the transaction is complete with the simple swipe of the hand? The chip is called a RFID. Radio-frequency identification. 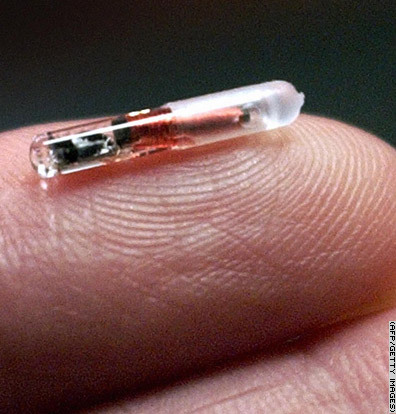 The tiny chip which is implanted just under the skin can hold 2 megabytes of data and be read from over 6 meters away. That is an incredible amount of information. Think about it; all your personal information, health records, financial information and maybe your baby pictures or a video of you singing at last year’s office Christmas party. The chip is manufactured by a company called Verichip. They were originally marketed to be implanted in pets so that they could be tracked if they became lost. Now parents are having them implanted in their children for the same reasons. The chip can remain in them for the rest of their lives and the data constantly upgraded without removing the chip. Verichip’s sales pitch has been for the safety and convenience of carrying your health information with you at all times so that medical professionals can act accordingly in a variety of situations. Watch the advertising video and then continue reading. It all sounds so comforting, doesn’t it? Verichip has now purchased a company called Steel Vault, an information security company that can store and track personal and financial records. The newly branded company is now called Positive ID and is capable of amalgamating all personal, health, and financial records onto one data base and place all the pertinent data on the RFID chip. If all this seems to you like far fetched sci-fi conspiracy theory stuff, then you are right where they want you to be. They RFID chip is already in use in several parts of the world and is catching on at an alarming rate. Warnings that this might be the Mark of the Beast, are being inexplicably ignored by the masses. Check out this incredible video of how the chip is being used in Europe. Oh, by the way, you already have a RFID chip in your wallet. By now your credit card has been upgraded to a ‘chip’ card. The chip is a RFID. You may also have one in your car if you have a toll road ‘speed pass’ or any ‘swipe and pay’ fob for paying at the gas station. They are being used at an accelerating rate in all kinds of applications. I cannot say for certain that the RFID is the Mark of the Beast, but it is definitely a good possibility. Maybe the thought of having a foreign object implanted under our skin seems disconcerting to some of us old fashioned folks, but not so to a new generation that has embraced the trend towards tattooing and body piercing at a frightening pace. I think it is all part of a diabolical plot to desensitize the population to what would have seemed seriously creepy only a few years ago. At any rate you won’t see me wearing a lip-ring or a RFID any time soon, but I am seriously concerned about a younger demographic who would not think twice about having another needle plunged into their already ‘beautifully adorned’ bodies. The Mark of the Beast is coming, and may already be here. Where are you planning on drawing the line? Or are you just going to be led down the garden path with billions of others?